• 2 Applications in one for all photo occasions: fill, reflect, enhance, and more! 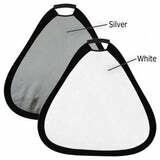 • Sturdy pro-grade materials; Includes handy, tear resistant nylon carrying pouch. 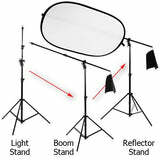 Fotodiox Premium-Grade 2-in-1 Reflector provides the ultimate in photo solutions in the studio and on location, eliminating the need for multiple reflectors, silks and solids. 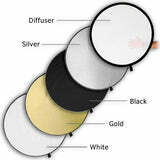 The reflector features Silver, for crisp, cool fill and Soft-Gold for a warmer fill. 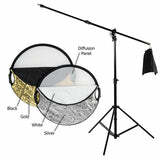 The reflector allows you to quickly and easily make adjustments to your lighting in order to get the look you want. 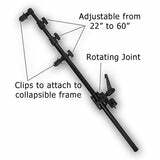 The purchase of a optional Reflector Arm w/ Universal Grip for a light stand or Reflector Armed Boom Stand is suggested to hold the disc where needed - especially if you are working without an assistant. Also, the disc is able to fold down to 1/3 its size and be stored inside the included carrying bag making it a breeze to transport and store. • Silver - Offers a neutral color balance similar to the white but with a higher contrast, increasing specular highlights. 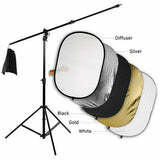 It's perfect for video, product shots and B&W photography. Major enhancement of the shadow area creating high contrast images. • Gold - Reflects a warmer light onto a subject, useful to enhancing skin tones for a more natural look or balancing a cool scene. Gold produces a natural, golden fill that is great for sunsets, jewelry, and indoor portraits. Major enhancement of the shadow area.